This weekend I looked up some ideas to enjoy the Christmas Spirit and decided to go to the Portland International Raceway where the largest drive thru display of Christmas lights in the Northwest was held. So tonight Mark and I left the house about 7pm and drove through traffic, yes there were still cars commuting, to the north end of Portland. I hummed songs to myself to get in the spirit and prepared to play Christmas songs on my iPhone while we drove through the highly anticipated displays. We paid the $16 entrance fee and proceeded for the next hour to drive along the track bumper to bumper with tail lights glaring as we past brightly colored yard art covered in Christmas lights, scattered throughout the grass. After we drove under the Reindeer tunnel we finally crawled toward the 12 Days of Christmas displays. I was so excited when the 11 Pipers Piping were actually on my side of the car so I could capture this Kodak (ok iPhone) moment to be remembered for the rest of my life. After that thrilling moment, I became The Grinch and broke the one car behind the other formation and started passing cars, buses and vans full of people merrily sing carols. Mark slide low in his seat so he couldn't be seen as I cleverly took my place back in line just in time for the grand finale, The Tunnel of Lights! Ohhh, ahhhh!!! After all this excitement I could hardly wait to come home to process my life long memory. So here it is in Peculator fashion. 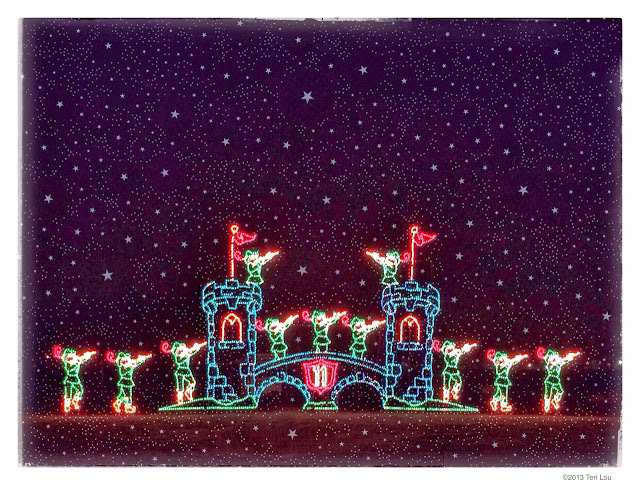 11 Pipers Piping among the stars. I hope this moment is just as memorable for you as it was for me. So if you are in Portland and want to see the Lights of Christmas, I suggest you try something other than the raceway, so you can actually enjoy your holiday moment.